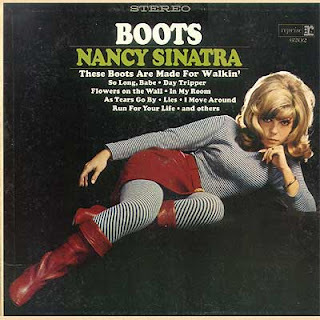 Reading a novel set in the American Civil War the other day I belatedly realised the significance of the lyric of Nancy Sinatra's "These Boots Are Made For Walkin'". Most cowboy boots had a cutaway heel which made them ideal for placing in stirrups but not so good for walking. Any boots which were good for walking would advertise the fact. Amazing how long it can take a penny to drop. P.S. Lee Hazlewood must have made a fortune out of this one song. @FrankOnTheRadio would appreciate this as an IEM:idiotic eureka moment. I always wondered why cowboy boots were so uncomfortable. If anyone hasn't seem it - The Wrecking Crew, as featured on TBWMFWalking, is worth a watch to see just why so many records sounded so good. It seems like my childhood listening was dominated by them. And yes I *knew* but as each classic song is mentioned it became even more astonishing. I wrote a thing about The Wrecking Crew film here if anyone's interested. I think it's on Netflix now. Half Blaine's drum fills are oh so perfect. Always different but still fitting the song. Pure genius. Out of curiosity, what was the novel ? Haven't read a civil war one since Woe to Live On.Time for another. The novel was "Shiloh" by Shelby Foote. Hadn't Lee already retired once prior to meeting Nancy, having had a song covered by Elvis? I do love his stuff but find it amusing that he was quite so successful as a song writer.